Seeing a mother reunited with her son who was denied a visa, a fiancé embraces his future bride who was in danger of deportation, or helping a cutting-edge sports apparel designer open her factory on US soil fuels our passion for what we do. Although US law offers many ways to reconnect loved ones and navigate a path through immigration law, the details can be daunting and dangerous. Mistakes and missteps can lead to bad results, delays, or increased costs. Seeing a mother reunited with her son who was denied a visa, a fiance embrace his future bride who was in danger of deportation, or helping a cutting-edge sports apparel designer open her factory on U.S. soil fuels our passion for what we do. Although U.S. law offers many ways to reconnect loved ones and navigate a path through immigration law, the details can be daunting and dangerous. Mistakes and missteps can lead to bad results, delays or increased costs. The results-oriented Wilner & O’Reilly family-based immigration practice group is chaired by Kelly S. O’Reilly, a former officer with the Immigration and Naturalization Service who has extensive experience and in-depth knowledge of immigration law. That knowledge and experience is crucial to navigating complex U.S. citizenship and U.S. visa and green card issues. Whether you have issues with asylum, deportation defense, entrepreneur’s visas, green cards, temporary visas, or any other U.S. immigration matters, with offices in California, Utah, and Idaho, Wilner & O’Reilly can help you throughout the Western United States. 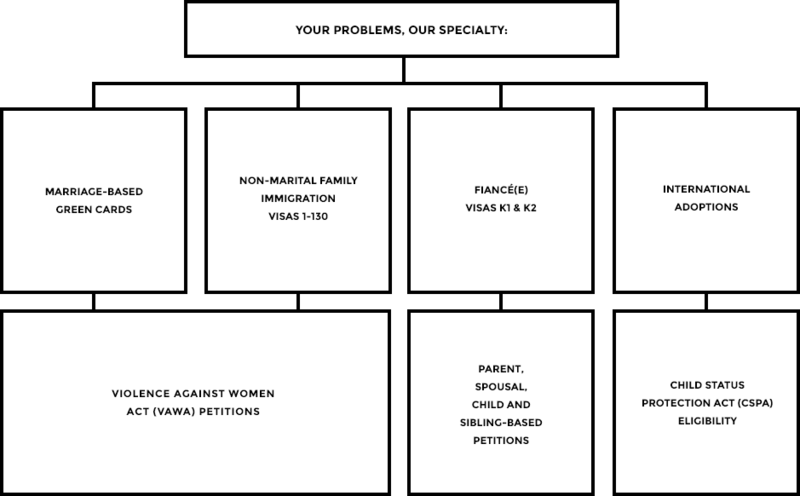 Contact the family visa lawyers at Wilner & O’Reilly by calling one of our offices toll free at 800-352-7034. You may also contact us online to schedule a confidential consultation with our immigration lawyers.